Building custom-designed decks is one of our specialties here at Preferred Outdoor Designs. You can hire us to design a new deck for your home or have us perform some renovation works on your old or damaged deck. All works are performed by experienced and trained crews, so you are assured of a professionally designed and built outdoor living space. If you're from Louisville, KY or surrounding area, please call one of our representatives now and we'll show you how we build this particular hardscape feature in your home. Preferred Outdoor Designs is the preferred deck installer of most homeowners in the state. Since we started operations years ago, we never failed in providing our clients with awesome outdoor living spaces. Whether they hire us to build from scratch a new view deck or renovate an old pool deck, we always deliver the kind of results they wanted. As a trusted design and build company, we always aim for the total satisfaction of our clients. We create custom-designed decks and install these outdoor features using top-notch materials. Our people are all professionals and highly skilled in this particular job. They are certified paver installers and artisans who will make sure that your deck is installed according to the approved design plan. 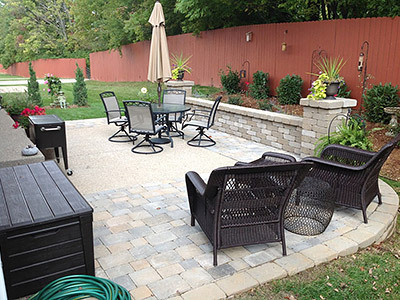 If you also want to have a successful outdoor improvement project, there is no other company to hire but us at Preferred Outdoor Designs. There are different types of materials that can be used on your deck installation project. For wood decks, we highly recommend premium quality hardwood. We use the best wood species such as Redwood, Cedar, and tropical hardwood. Composites are also popular among homeowners because of their long-lasting quality. Top brands are now offering low-maintenance and weather-resistant composites, so this is another good option. For projects involving pool deck installation, we typically use paving materials such as bricks, stones, and concrete pavers. Concrete paving is the most popular option for pool decks because it is durable and cheaper to install. The good thing about concrete pavers is that you can choose the design that will suit your needs and preferences. You can choose the Old World theme or a much modern look to showcase the beauty of your deck or entire outdoor space. At Preferred Outdoor Designs, clients will never spend beyond their budget since we offer client-friendly pricing. We don't charge exorbitant fees just to prove our expertise in this field. As a home-grown company, we want to be known in the state as an affordable option when it comes to deck design and installation. Homeowners who are looking for deck renovation experts should also call us. We can perform the necessary repairs and maintenance works on your old deck to bring back its function and beauty. Some of the paver brands that we use include Belgard and Pavestone. These companies offer a wide range of designs, so choosing the perfect pattern, shape, or color for your decks will be easy. If you have more questions on our deck design and installation services, please visit our office or call our hotline today at (502) 245-3997.